Storing hierarchical data can be a pain when using the wrong tools. However, Neo4j is a good fit for these kind of problems, and this post will show you an example of how it can be used. To top it off, today it’s time to have a look at the Neo4j Python language bindings as well. A little background info for newcomers: Neo4j stores data as nodes and relationships, with key-value style properties on both. Relationships connect two different nodes to each other, and are both typed and directed. Relationships can be traversed in both directions (the direction can also be ignored when traversing if you like). You can create any relationship types; they are identified by their name. For a quick introduction to the Neo4j Python bindings, have a look at the Neo4j.py component site. There’s also slides and video from a PyCon 2010 presentation by Tobias Ivarsson of the Neo4j team, who also contributed the Python code for this blog post. If you take a look at a site like stackoverflow.com you will find many questions on how to store categories or, generally speaking, hierarchies in a database. In this blog post, we’re going to look at how to implement something like what’s asked for here using Neo4j. However, using a graph database will allow us to bring the concept a bit further. It may come as a surprise to some readers, but even though we’re using a graph database here, we’ll use a common Entity-Relationship Diagram. The entities we want to handle in this case are categories and products. The products holds attribute values, and we want to be able to define types and constraints on these attributes. The attributes that products can hold are defined on categories and inherited to all descendants. 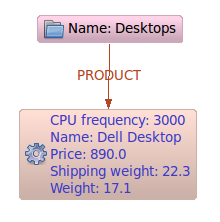 Products, categories and attribute types are modeled as entities, while the attributes have been modeled as relationships in this case. Categories may contain subcategories and products. 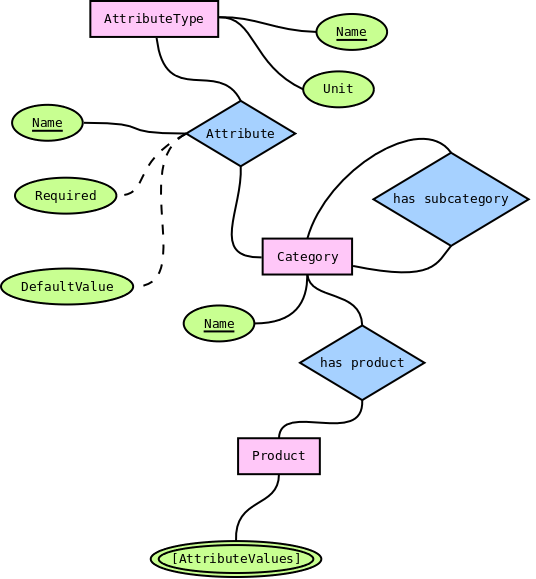 What can’t be expressed nicely in the ER-Diagram are the attribute values, as the actual names of those attributes are defined as data elsewhere in the model. This mix of metadata and data may be a problem when using other underlying data models, but for a graph database, this is actually how it’s supposed to be used. When using an RDBMS with it’s underlying tabular model, the Entity-Attribute-Value model is a commonly suggested way of dealing with the data/metadata split. However, this solution comes with some downsides and hurts performance a lot. That was it for the theoretical part, let’s get on to the practical stuff! What we want to do is to transfer the data model to the node space – that’s Neo4j lingo for a graph database instance, as it consists of nodes and relationship between nodes. The image above gives an overview; the rest of the post will get into implementation details and good practices that can be useful. When a new Neo4j database is created, it already contains one single node, known as the reference node. This node can be used as a main entry point to the graph. Next, we’ll show a useful pattern for this. It’s redundant as we can find them by traversing from the category root. If we want to find a single product, it’s more useful to index them on a property, like their name. We’ll save that one for another blog post, though. Note that when using a graph database, the graph structure lends itself well to indexing. … where graphdb is the current Neo4j instance. Note that the subreference node itself doesn’t have a “node type”, but is implicitly given a type by the ATTRIBUTE_ROOT typed relationship leading to the node. The next thing we need to take care of is connecting all attribute type nodes properly with the subreference node. Now let’s see how to add subcategories. This traverser will follow outgoing relationships for both SUBCATEGORY and PRODUCT type relationships. It will filter out the starting node and only return nodes reached over a PRODUCT relationship. At the core of our example is the way it adds attribute definitions to the categories. 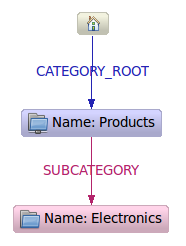 Attributes are modeled as relationships between a category and an attribute type node. The attribute type node holds information on the type – in our case only a name and a unit – while the relationship holds the name, a “required” flag and, in some cases, a default value as well. Our last code sample will show how to fetch all attribute definitions which apply to a product. 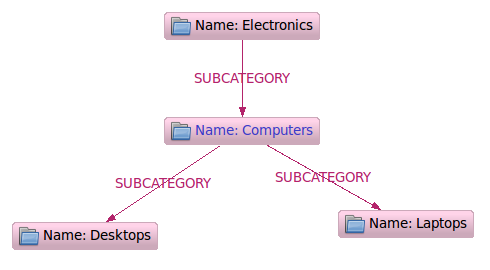 Here we’ll define a traverser named categories which will find all categories for a product. The traverser is used by the attributes function, which will yield all the ATTRIBUTE relationship. As the image above shows, it’s really simple to find out which attributes (or categories) are using a specific attribute type. This is typical when working with a graph database: connect the nodes according to your data model, and you’ll be fine. Hi, how did you generate these pictures of your graph modelaf? Did you used Neoclipse?<br /><br />Great post, by the way. These kind of samples and patterns are very useful. Hi Passaro, thanks for your kind words!<br /><br />We used Neoclipse to visualize the Neo4j node space, and Dia for the data model. 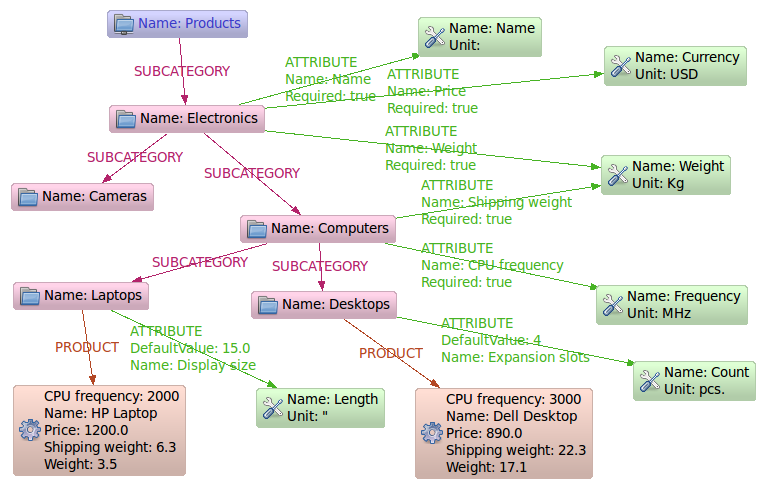 each time i view d database in neoclipse…everythin keeps gettin doubled…plz help!! Apparently, the reference node concept is deprecated, and you&#39;re encouraged to use indexes instead when finding nodes. How are the Product nodes’ attribute values connected to their respective Attribute nodes? Or is that not necessary?